Adult volunteer mentors are an essential component for this national award winning program. Volunteers assist with preparation and distribution of applications to representatives at Valley schools and assist in preparing recording packs and materials for the youth teams. Adult volunteers also play a key role during the two-week program, mentoring the youth in the field and in data base entry techniques. ﻿The first day is a full-day youth and adult mentor recorder powerpoint training. Field mentoring is for eight weekdays starting at 7am, ending about 1pm. The last day is spent in the computer labs at Northern New Mexico College where the young people are trained in Geographical Information System by Environmental Sciences Professor Joaquin Gallegos. No prior archaeological experience is necessary, as adults are trained along with the youth. 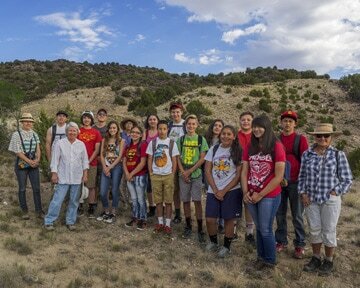 Good physical condition is important as adults will climb up on Mesa Prieta with the youth teams in search of petroglyphs and other archaeological features. Preference is given to mentors who can attend the full two weeks.